I did intend on doing a post on how to make a classic prohibition era cocktail, but I decided it would be better to do cocktail inspired cupcakes instead. 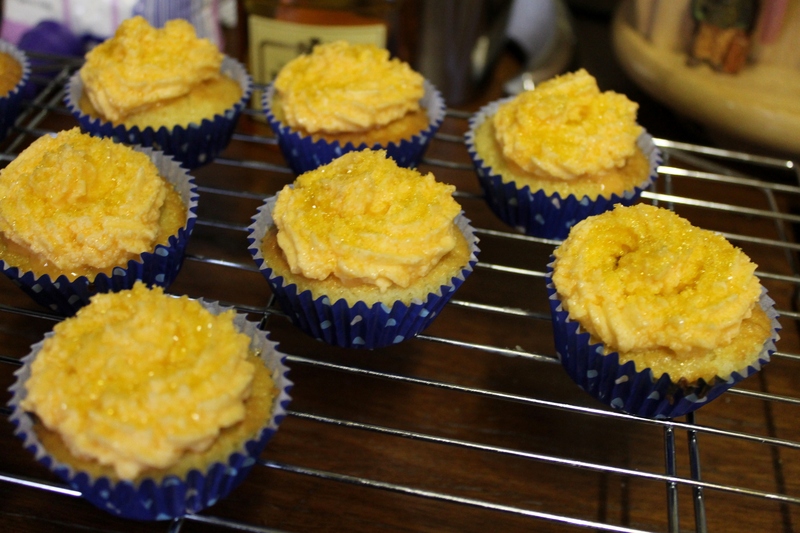 This is my own Sidecar cupcake recipe, adapted from a simple lemon cupcake recipe. Add the butter, caster sugar, lemon zest and cointreau to a mixing bowl and mix with an electric mixer for 7 minutes, or until light and fluffy. Add the eggs, one at a time and mix for 2 minutes. Mix the flour and baking powder in a separate bowl, then add to the mixing bowl (with the butter, sugar etc.) and mix until incorporated. Add the milk and mix for a further minute. Divide the mixture evenly between the patty pans. Bake for 25 minutes or until golden on top. Remove the baked cupcakes from the oven and immediately transfer to a wire rack to cool completely. Cream the butter, lemon zest and brandy together with an electric mixer for 2 minutes until light and fluffy. Add the icing sugar, milk and food colouring. Mix for a further 2 minutes until well blended. Top the cupcakes with frosting, either by piping or spreading with a palette knife. I used a fan-forced oven and it turned out that even 20 minutes was going to be too long. You may need to judge for yourself, by smell and look, to know when they're ready. 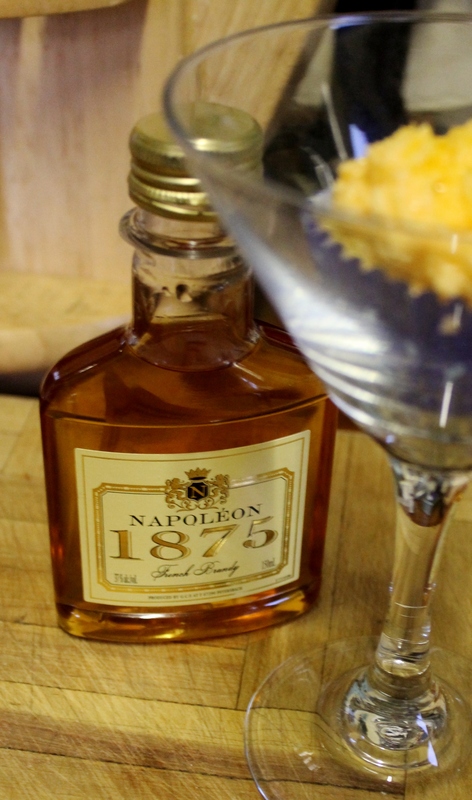 The Sidecar cocktail was popular in the prohibition era, back then it was usually made with cognac, triple sec and lemon juice. There are a few different variations, including the brandy recipe that I used for inspiration in my sidecar cupcake recipe. A warning when making the frosting, don’t go overboard with the brandy (especially if you’re using the real stuff). I tasted my frosting before I piped it and all I could taste was the lemon zest, so I added (what I thought was) a little more…big mistake, the brandy near took my breath away! 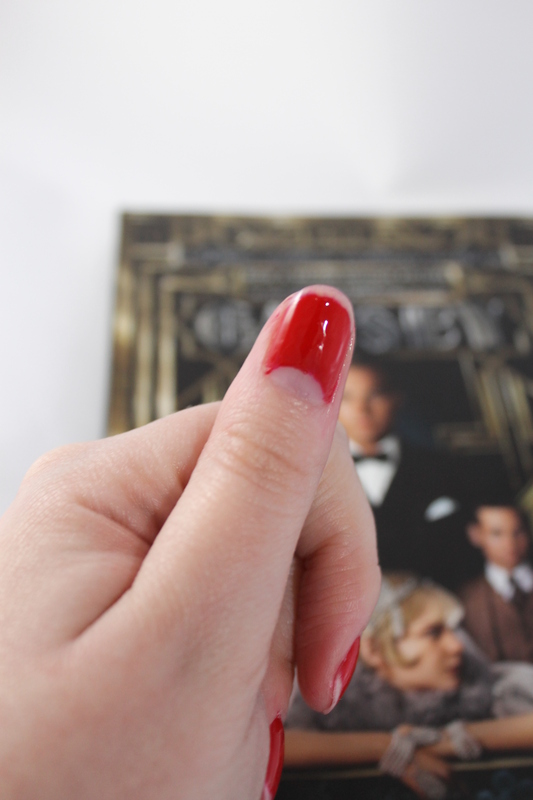 The moment I got the idea to do ‘5 days of Gatsby’, I knew that I wanted to do a nail post. I thought of doing an art deco manicure (similar to the pattern from the movie’s promo posters and the tie-in novel cover below), but there are quite a few variations of that idea around the web already. I decided to research what a Classic 1920s Manicure looked like and do that in stead. From different sources I have found conflicting information on this manicure. Some sites say it was not worn until late to mid ’30s, but others say it started in the early ’20s. From what I have read and from old print ads I’ve seen online, I’d say it was the latter. It has most commonly been referred to as the ‘moon manicure’, but I have also seen it being called the ‘Paris manicure’. In the late 1930s/early 1940s the manicure changed a little, women no longer left the tips of their nails bare and filed the tips into a slight point (like Dita Von Tesse wears now). Prep your nails by filing any uneven edges, a rounded edge works best for this manicure. Then apply a base coat. 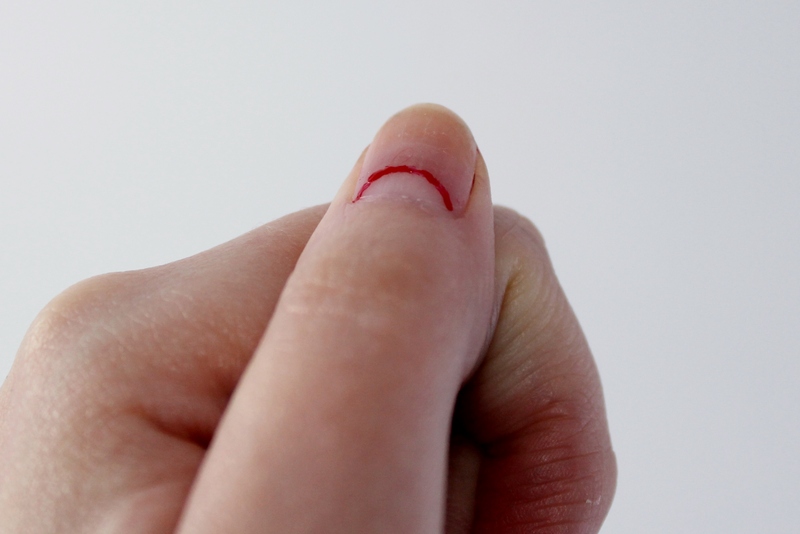 To create the half moon I drew on the shape at the base of my nails with a tooth pick. You can also use reinforcement rings (the stickers that go over binder holes), if you want a guide for your half moon shapes. Then paint the rest of the nail, being careful not to go over the line of the half moon. 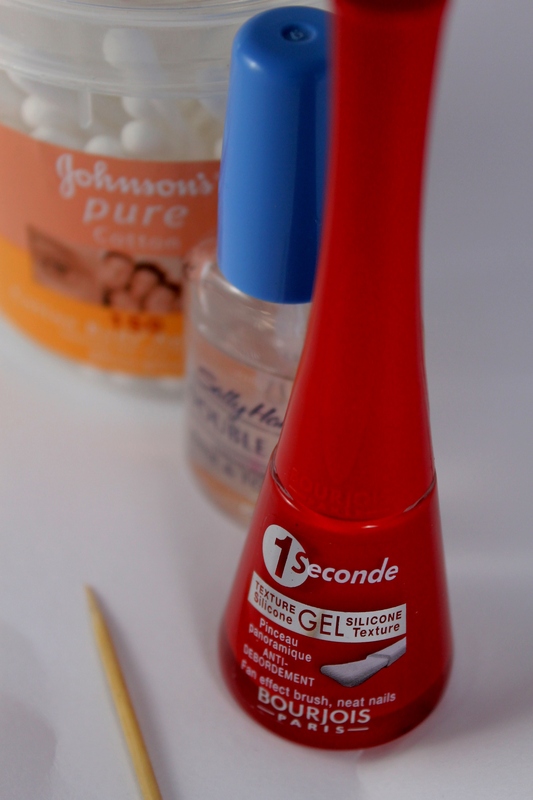 Clean up the edges of your nails by using a cotton bud dipped in nail polish remover. 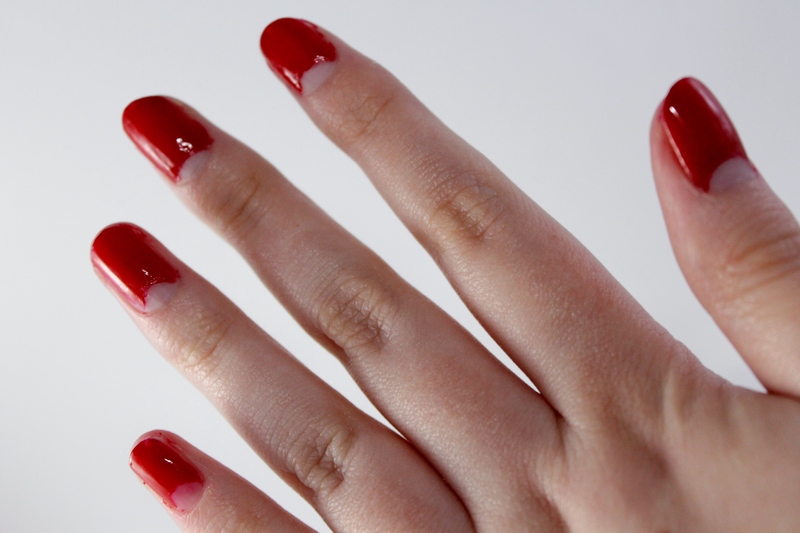 The final step is to rub off the tips of each nail with another cotton bud (dipped in remover), you may need to use a few so there is no red stain left on there. If you don’t rub off enough of the tip, it will look like they have worn away. A little less than the width of a french tip will do. No top coat is needed, as this manicure was designed to last longer than if it was a full painted nail! This Classic 1920s manicure was normally only worn by ‘society’ women, it sort of served as a status symbol until the 1930’s when the tips were painted and only the ‘moon’ left bare. I thought I would mention, this manicure does kind of tie in with The Great Gatsby. 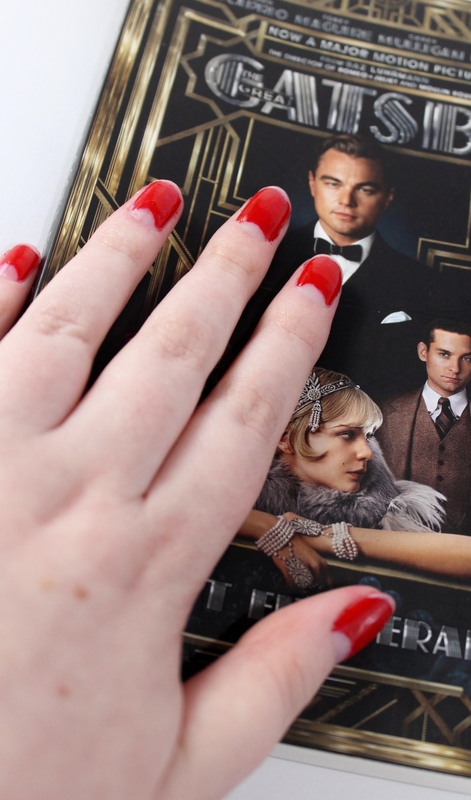 I won’t know for sure until I see the movie, but from what I have seen in the trailers ‘Jordan Baker’ is seen wearing the same (if not, similar) manicure at one of Gatsby’s house parties. I hope you liked my 1920s manicure tutorial. Come back tomorrow for Day 3 of my 5 Days of Gatsby.